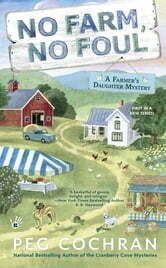 No Farm, No Foul by Peg Cochran is the first book in the Farmer's Daughter Mystery series. Shelby McDonald is running her family farm (Love Blossom Farm) and taking care of her two children (Amelia and Billy). Shelby's husband has passed away (Wild Bill) and Shelby still misses him (and it does not help that his brother looks so much like Bill). Shelby is hosting a potluck on the farm for St. Andrew's Church to raise money for the desperately needed new roof. Prudence, the pastor's wife, was washing out her crockpot in the mudroom sink, and Shelby went to check on her. Shelby found Prudence dead on the floor of the mudroom with the cord to the crockpot wrapped around her neck. Shelby rushes outside and yells for someone to call 911. While waiting for the police, several people go into the mudroom (ruining the crime scene) to check it out (idiots). Who wanted Prudence dead? She was annoying, but worth killing? Shelby cannot help but look into this crime (it did happen in her mudroom). Maybe there is more to the pastor and his wife than any of them know (like why has the pastor had three different placements in three years). Can Shelby find the culprit before the killer decides she has been too nosy? No Farm, No Foul is a good concept, but needs a little work. Too much time is spent on Amelia, Shelby's daughter, and the many ways the tween has found to disobey and annoy her mother (and the mother is not taking the appropriate action). I wanted more time spent on the murder and less on Amelia's antics. It got on my nerves! I liked Shelby's blog posts (humorous and interesting). She mentions some delicious sounding recipes (which are at the end of the book). No Farm, No Foul is easy to read, entertaining and likeable characters, and a great setting (Love Blossom Farm in Lovett, Michigan). The mystery was extremely simple and easy to solve. I knew who committed the crime before the body was found (not good). One clue was all I needed to solve it (it was obvious). I give No Farm, No Foul 3.75 out of 5 stars. I think the author could have used fewer ten dollar words (that’s what my father always called them). An example is obstreperousness (it means noisily unruly or defiant). Did she really need to use this word? That is just one example. With a little tweaking, this could be a very enjoyable new cozy mystery series. I will read the next book in A Farmer’s Daughter Mystery series. 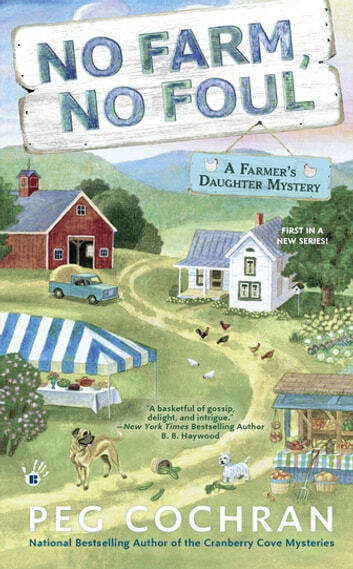 I received a complimentary copy of No Farm, No Foul from NetGalley in exchange for an honest review. The comments and opinions expressed are strictly my own.